Why is it that I have opted to write this article in 2009? Well, for lack of a better reason...it was on my mind as I was going over some of my OVER 100,000 Elvis Photos and found some of when Elvis and I last met and talked (which was a few months before he died). Elvis was in a good mood, always asking about how I was doind in school, karate, sports, etc.. Every memory with Elvis I will always...treasure. During that conversation, as it did many times, Elvis talked about Lisa and his hopes and dreams for her. The man LOVED his daughter and typing these words is making me very emotional recalling our conversations but these stories need to be told. Next year Lisa Marie Presley will turn 42 years of age. Every Elvis Presley Fan, and Lisa Marie Presley Fan, should be aware of this date and afford Lisa Marie Presley (and her family) the opportunity to celebrate this birthday in whatever forum (i.e. peace and quiet, family only, in public, eke.) that they desire. There is a CONNECTION between achieving the age of 42 and the Presley Family. On August 14, 1958 Gladys Love Presley died and her only (surviving) son, Elvis Aron Presley, believed that she was 42 years old (in reality she was 46 and Elvis never knew this but it is/was factually correct nonetheless). Throughout Elvis' life he was often said to state, openly and in private, that he believed that he would "not outlive Mamma". Elvis LOVED Gladys Love Presley with every cell of his being and he was DEVESTATED by her loss. When Elvis hit the "age of 40" it was apparent to those close to Elvis that it burdened him greatly. It seemed that the references to his Mother's age of 42 was becoming more and more on his mind and in discussions with Vernon and Dodger (Elvis Grandmother, Vernon's Mother, and ex-wife of Jesse) throughout 1975, 1976, and 1977. 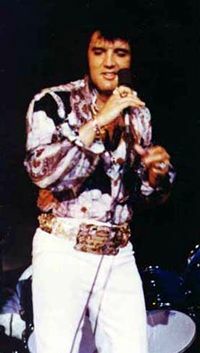 In August of 1977 many things that Elvis did were "unusual" even for Elvis. I believe that one of the most "revealing" things that Elvis did was that he opted to update/change his will with a sense of "urgency". The normally "secretive" Elvis opted to have his girlfriend, Ginger Alden, witness the signing of his Will along with several other "valued" individuals who Elvis trusted...unconditionally. Sadly, on August 16, 1977 Elvis Aron Presley left this World taking with him many unanswered questions but leaving behind a beautiful daughter — ex wife — and millions of Fans (including those yet to be born). I believe that Elvis (himself) believed that August, during the forty-second year of his birth, weighed heavily on him. I also believe that those who were close to Elvis, and survive until this day, may not "publicly" agree with this statement (in context) but perhaps they would. Regardless there are many "similarities" in the personalities, and life style, between Gladys Love Presley and Elvis Aron Presley and Lisa Marie Presley. It would not surprise me if Lisa Marie Presley has thought allot about turning "42" in 2010 when, as a child, the age of "42" must have seemed...unreachable. It is our hope that those closest to Lisa Marie Presley will be "aware" of this event and keep her close during the month of August of 2010. To provider her with "open ears", love, and support throughout. Even if she does not publicly acknowledge turning 42 the fact remains that destiny has brought the age of 42 and the month of August to be one of great tragedy for the Presley Family...and to those who loved them and still do. It is with great empathy that I write these words which are my thoughts towards Lisa Marie Presley. I wish her, and her family, nothing but happiness in all of her personal and professional endeavors. Having studied Elvis for the majority of my life one thing I have learned is that no amount of people can change what is put into one's own head for only they can reconcile their thoughts, fears, goals, etc. However, we can all be supportive knowing that "unspoken words" can be an indication of...deep thought (i.e. fear, uncertainty, etc.). In closing, I would be remiss if I did not say THANK YOU to Priscilla Presley, Lisa Marie Presley, and Joe Esposito (among others) for all they have done for Elvis Fans Worldwide. May 2010 be a wonderful year for them and for Lisa Marie Presley specifically.